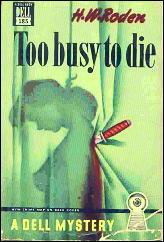 » Reviewed by William F. Deeck: H. W. RODEN – You Only Hang Once. 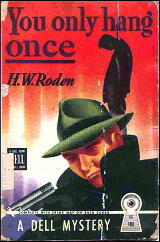 Reviewed by William F. Deeck: H. W. RODEN – You Only Hang Once. 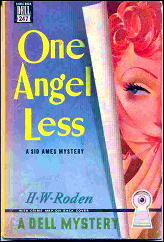 H. W. RODEN – You Only Hang Once. William Morrow, hardcover, 1944. Hardcover reprint: Detective Book Club, 3-in-1 edition, April 1944. Paperback: Dell #104, mapback edition, 1945. Another case here for the lack of talents of Sid Ames, private eye. 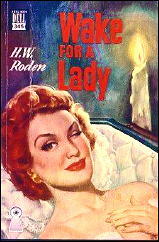 When Johnny Knight, public-relations man, finds a dead lawyer in his office, he calls on Ames. Things don’t work out too well with Ames in charge. Later, when Ames and Knight are at a gambling joint where peril looms, Ames proceeds to get drunk and pass out. At a meeting with most of the suspects in the lawyer’s murder, Ames gets a message from his office, which his secretary tells to the butler so all can hear. Just in case the possible murderer might have missed something or been slow on the uptake, Knight, a runner-up to Ames in stupidity, reveals that the message was from the deceased lawyer’s paramour. Ames and Knight then deliberately dawdle before going to see the woman. Imagine their surprise to find that someone has strangled her. The novel would be funny if it were only humorous. — From The MYSTERY FANcier, Vol. 13, No. 3, Summer 1992. RODEN, H(enry) W(isdom). 1895-1963. JK= Johnny Knight, SA = Sid Ames. H. W. Roden is one of those mystery authors known only to collectors of Dell mapbacks, perhaps also a dying breed, but I think you’d have to agree that the covers are striking, even if Bill didn’t care much for the story. He certainly left no doubt as to that! I read one of the Sid Ames-Johnny Knight books, but right now I couldn’t tell you which one. (Not the one above.) I wonder if I ever finished it. It may have been a Detective Book Club edition, one still hiding under my nightstand table. I don’t remember thinking it was bad, though, just not good. Roden must have been highly regarded in his day. Morrow was a high profile publisher, and so was Dell. All four books were also picked up by the Detective Book Club. Tastes changes, especially when it comes to humor, as we’ve discussed before, and even more so when leading characters pass out drunk on you. Or when the stories incorporate some of the worst cliches of detective fiction? Steve mentions how striking the Dell mapback covers are and the whole set is worth collecting just for the excellent covers and the backcover maps. Prices have dropped alot on the Dell maps and now they are not that expensive. I amassed a just about complete set back in the 1970’s, thinking the prices would continue to rise, but that has not been the case at all. Another example of a set I’ll just keep rather than give them away for very little. The Dell Mapbacks are indeed attractive and well worth collecting. I read one Roden novel, WAKE FOR A LADY, in the hardcover edition, and while I don’t recall a lot about it I liked it better than this. I wonder if this one was just a misfire? I’m relying on Dell’s numbering to say so, since both of Roden’s first two novels came out in 1944, but it looks as though YOU ONLY HANG ONCE came before the other. If so, using Bill’s report as a basis, there was nowhere for him to go but up. Too Busy to Die certainly has an impressive silhouette!